Oklahoma is home to wonderfully diverse terrain. Whether you’re looking to explore almost desert-like conditions, or deep forests, there is an eclectic range of conditions to discover. And what better way to do that than on a hiking trail? Pack your water, grab your trail map and enjoy the 15 best hiking trails in Oklahoma. This urban wilderness, located minutes from downtown Tulsa, is accessible to hikers, runners, bikers and horse riders. Dogs on leashes are also permitted. The yellow trail is almost four miles, while the pink trail is six miles. The trails are rated moderate. One of the most popular state parks in Oklahoma, Roman Nose was once a winter campground of the Cheyenne. Today, the site is home to a beautiful retreat featuring many activities, including a 2.9-mile walking trail rated at a moderate level of difficulty. Bring your dog, but keep him on a leash. 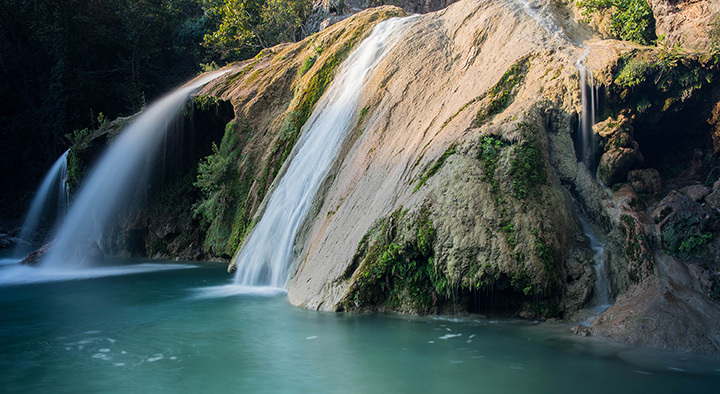 The main reason to hike this moderate 3.5-mile trail is to view the 77-foot waterfall. During the summer months, swim in a natural setting, fish, picnic and explore the caves as part of your trip. This 3.4-mile trail is easy and kid-friendly. It’s in the northeast section of Oklahoma City near Lake Hefner. A river runs through the park, and it’s open year-round. Skyline Trail at Beavers Bend is a difficult seven-mile trail that’s highly recommended because of the waterfall, but the park features five nature trails and 12 miles of hiking trails for beginners to experienced hikers. Explore the Wichita Mountains via this 2.2-mile moderate rated trail not far from Lawton, Oklahoma. Bird watching is a popular pastime year-round. Dogs on a leash are welcome. With a lake and a swinging bridge, the 12.4-mile Ankle Express Trail is a moderately difficult trail in a family-friendly state park. Although the trail is intended for overnight hikers and bikers, many day hikers use it also. The north loop is a tougher trail than the south loop. Mountain bikers and hikers of all skill levels all welcome in this park featuring 18.5 miles of trails. The Green Loop and Yellow Loops are designed for beginners. Intermediate hikers should try the Red Loop and Blue Loop. For a challenge, try the 10-mile Gold Loop. The trails are connected, but can also be hiked individually. Robber’s Cave Trail is only 0.9-miles, but it’s rated as a difficult. It leads to a cave that’s said to be a hideout for some of the most notorious outlaws of the west. The main trail is about four miles, but there are several adjoining trails that offer more a challenge. Enjoy the beautiful scenic views of the Illinois River. Spend the weekend and take a float trip when the weather is nice for an additional day of fun. Find six different loops of trails at Lake Stanley Draper for hikers and bikers of all skill levels. According to OKC ordinance, riders must wear a helmet. Be cautious of the vegetation, because there is poison ivy along the trail. In the summer, watch out for ticks. Lake McMurty features four different trails between six and 7.5-miles long. Although heavily used by mountain bikes, these trails also popular for hikers. Dogs are welcome on the trails. Bromide Hill Trail is just one of three trails at this beautiful site in the Arbuckle Mountains. The park is open all year long, but the trails might be more difficult to access in the winter months. Take one of the two main trails, the Anadarche Trail and the Buckhorn Trial, for sightings of deer and other wild animals. North Anadarche Trails is 6.3 miles and used for hiking, walking and mountain biking year-round. Rappelling down the side of the canyon walls may be one of the most popular activities at Red Rock, but the 0.6-mile Rough Horsetail Nature Trail makes a good hike for adults and kids alike. You’ll walk along the canyon rim and get excellent views of the area. View more Oklahoma Hiking Trails.